Q: I have straight hair and I’m always trying to add a curl. I’ve tried rollers but they take so long to put in and set. I’m looking for a good tong that will give a big bouncy curl. Can you help? A: I’m a big fan of curling tongs. Not only do they give a gorgeous tousled feel, they provide volume at the root too. If you’re after a graduated curl (tighter at the bottom), choose a tapered wand, which gets thinner at the end. For big, bouncy curls choose a barrel of at least 32mm. The Remington Pearl Pro Curl, £27.99, Boots, has a professional size barrel and a digital LCD display so you can control how hot the ceramic plates go. 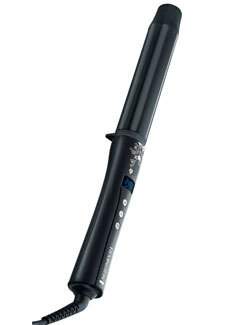 Plus, they don’t have a clip – you just wrap your hair around the barrel – so they’re super-easy to use. Tesco also has a great new range of electrical hair tools, called T-H-X. Their Wave Hello 32mm Tong, £27.94, Tesco, heats up in just 30 seconds and the long barrel is great for those with longer hair.